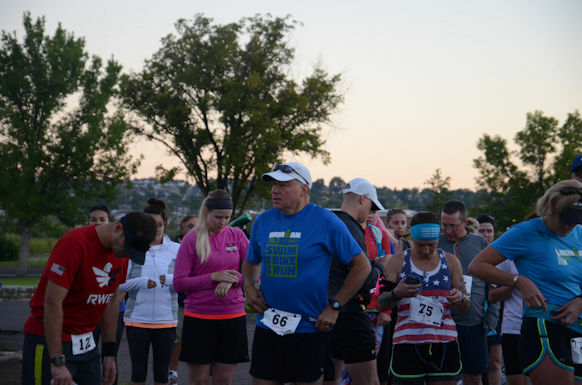 Welcome to Great Falls for the best kept secret in Montana Half Marathons! The weather is likely to be warm, so train and prepare accordingly. We start at 7am so most should be in off the course before it gets TOO warm. Our course is flat and follows the river throughout the city. 2019 Event Guide will be posted soon. If you still have questions, reach out to Tina at 406-788-9319. Late/Race day registration is available, however you'll pay a little more. Fees increase on August 5th for all three runs. We do not guarantee shirts or packets after the 6th. Packet pickup is at the Foot & Ankle Clinic 1301 11th Ave S., Great Falls, MT the Saturday before race day between 3pm and 6pm. Yes, you can pick up packets for friends/family. Yes, you can pick up your packets on race day as well until 6:45am. Matthew Smeltzer of Competitive Timing will be timing the races. SCHEELS is providing water, gift cards and awesome volunteers! Meadow Gold, as always, will be providing participants with Chocolate Milk. Karin Steinke will be photographing all you awesome participants and volunteers so make sure you wave & smile when you see her out on the course!. Mighty Mo Cup O'Joe will be on-hand to serve up some spectacular coffee... STAR Radio will be on hand for a live remote broadcast! If you know of anyone who would like to attend as a vendor, please have them reach out to us! We would love to have them join the fun! Hal Higdon has training plans for all variety of runners and experience levels. Take a look at the 12 Week Half Marathon plan or the 8 week 10k training plan for starters. These should help you get started or use his site to find one that fits your experience and fitness level. There are tons of good plans out there on the ol' interwebs... find the one that is right for you but please be sure to check with your doctor before beginning any new exercise program. Want to Volunteer to help at the event? We always need more volunteers! 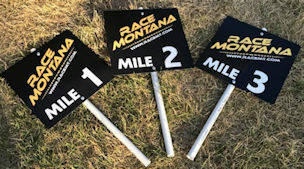 Race Montana is run by 7 volunteers who put on several events a year so we would love all the help we can get! Please sign up at Runsignup.com and pick the spot and time that works best for you. 7am start. Start/Finish in Elks Riverside Park. Walkers are welcome. Early start is allowed for those not wanting an official time. Event closes at 12pm. Technical shirt and Medals for all participants. 1st/2nd Place Male/Female winners awarded prizes. The Half follows the river with two double-backs, one on each side. You'll have beautiful view of the Missouri through the entire race. It is a mixture of concrete and paved path with one road crossing and a short gravel loop on the dam island. There is only one slight hill coming up out of the dam. There are several short "inclines" but no other hills worth the mention. It truly is a very flat race. Great race to PR with! 7:45am start. Start/Finish in Elks Riverside Park. Walkers are welcome. Event closes at 12pm. Technical shirt and Medals for all participants. 1st Place Male/Female winners awarded prizes. The 10k race course stays completely within city limits. It is a mixture of concrete and paved path with one road crossing. It too is very flat and incorporates the bridge to bridge loop with two short double backs on the west end and on the east end near the Missouri River Diner. Also a good race to 10k PR on!. 10am start. Course is a half-mile loop inside the park. Kids dash is once around the loop, 1 mile run/walk is twice around the loop. Entire course is visible from the start so you can watch your kids run the whole way. Same start and finish line as the 10k and Half Marathon. Cotton shirt for all participants. Open to all ages. A fun run to get the kids interested in racing!